Changing in the Forex market conditions. Health problems of software developers. What is Relativity System ? The Expert Advisor has been developed for more than five years according to the Trade for Living concept. The most suitable time for trading. The EA should have long-term stable profitability. The EA should survive at least 3 years in retrospective testing. Pending order breakout trading method. Smart money management : Calculated lot size by % of the account balance. Most efficient on USDJPY currency. Management_Percent - Risk percentage setting for each trade. Example: setting = 2.3 > the EA will trade by lot size = 2.3% of account balance. Equity_Mode - If setting = true > the EA will calculate lot size from % of account equity. If setting = false > the EA will calculate lot size from % of account balance. Custom_Time_Trade - Time setting to open trade, pending order (broker time). All these parameters made for future optimization update for adaptation according behavioral of Forex market. ATR_Range - Setting ATR indicator level (maximum average daily price movement). Profit_Protect_Mode - If setting = true > the EA will open order by separate 2 take profit level. If setting = false > the EA will open order by 1 take profit level. TPX_Level_1 - First take profit level setting (Calculate from stop loss level). Example: TPX_Level_1 setting = 1 > take profit will = 1x of stop loss level. TPX_Level_2 - Second take profit level setting (Calculate from stop loss level). Example: TPX_Level_2 setting = 2 > take profit will = 2x of stop loss level. Partially_Close_TP1 - If setting = true > Use partially close on TP level 1. If setting = false > Not use partially close on TP level 1. Close_Range_TP1 - Setting percent of TP1 length to partially close. Close_Percent_TP1 - Setting percent of TP1 lot size to partially close. Partially_Close_TP2 - If setting = true > Use partially close on TP level 2. If setting = false > Not use partially close on TP level 2. Close_Range_TP2 - Setting percent of TP2 length to partially close. Close_Percent_TP2 - Setting percent of TP2 lot size to partially close. Indicator_1_Value – 12 Value - Indicator value setting for trend analysis. These value are best setting from optimization based on 3 years statistic available. Processing_Time - Time end for open pending order setting (minute). Example: Custom_Time_Trade setting = 8 and Processing_Time = 5 > the EA will open pending order at time 08:00 - 08:05 only (broker time). Magic_Start - Magic number setting for all orders opened by the EA. You should set it with a unique number if you run another EA on your account at the same time. You should have trading experience on Forex market more than 1 year. Please try free demo testing on Metatrader strategy tester , make sure you really understand how EA work before you buy. We regret to inform you that performance in the past can't guarantee to the future. We can't guarantee profits, losses in the future and no refund policies. Trading Forex on margin carries a high level of risk, and may not be suitable for all investors. Great long term EA. Developer is extremely dedicated to updating the EA to ensure its longevity. Support is excellent. Excellent service from the author always very responsive. ,I feel like he never sleeps and always answers my question. *This EA is for long term , Not for quick money. - Re-optimized all system parameters based on 3 years statistics. - Add partially close strategy. * Add new input parameters. If setting = true > Use partially close on TP level 1. If setting = false > Not use partially close on TP level 1. Setting percent of TP1 length to partially close. Setting percent of TP1 lot size to partially close. If setting = true > Use partially close on TP level 2. If setting = false > Not use partially close on TP level 2. Setting percent of TP2 length to partially close. Setting percent of TP2 lot size to partially close. - Improved trend analysis system. - Improved take profit calculation. Decrease take profit level from 2X of stoploss to 1.95X of stoploss. - Re-optimized the system, adaptation for behavior of Forex market based on 3 years statistics. - Modified take profit level to be suitable for different account spread. 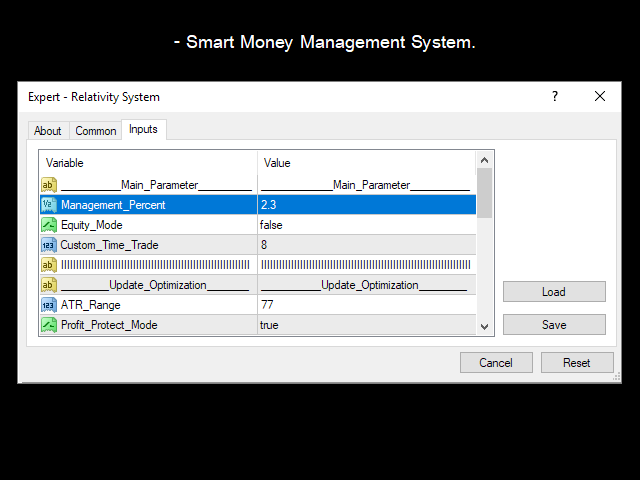 - Changed money management risk setting to 2.3% for each trade. Fixed wrong text showing on the screen (change text from V.1.8 to V.1.9). to find better entry and exit for the system. - Improve trend analysis method to identify overbought, oversold and sideways market condition. - Adapt trading strategy for different types of markets. - Add ATR indicator for trend analysis. - Re optimization all parameters. - Add parameters for optimization in future updates. Improve performance by re optimization make the system lower draw down. EA will calculate the right time to open order for different brokers. - Fix problem can't open order with some broker have high stops level. - Fixed trading symbols containing different suffixes (like USDJPY#, USDJPY-). - New optimization build for USD/JPY. - New strategies long term trading and no scalping. - Work best on USD/JPY timeframe H1. with fixed stop-loss 5 pips and take profit 20 pips. if setting Month Filter = True EA will not make any trade on June and November. - Added the spread protection function. - Auto GMT calculation function. *Run on EURUSD timeframe H1 (one currency only) for the best result.